The second leg of the Inlaws & Outlaws Movie Tour had a tremendous New England kick off this past Thursday, March 27 with a special presentation of the film at the beautiful Music Hall in Portsmouth, New Hampshire. Joining director Drew Emery at the Music Hall was the Rt. Rev. 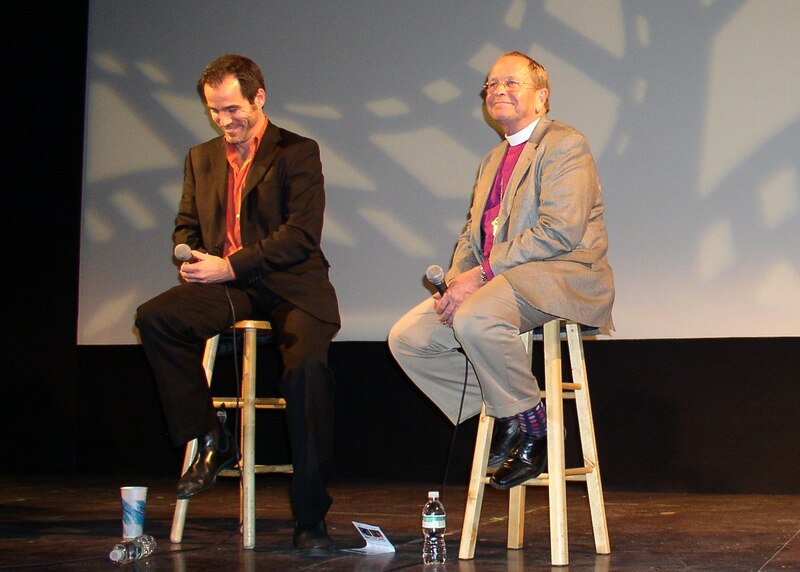 Gene Robinson, the first and only openly gay bishop of the Episcopal Church, and bishop of the New Hampshire Diocese. Drew and Bishop Robinson's audience discussion following the film screening was an emotional highlight of the evening, moving many to tears. Read what two audience members wrote about their experiences here. 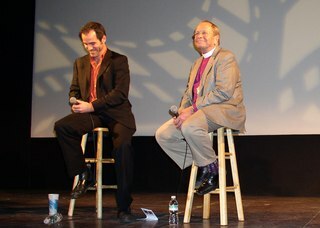 Bishop Robinson spoke of the film with great admiration. "Every time I see it, I see new meaning and hope and inspiration." He views the film's portrayals of gay and lesbian relationships in the context of all relationships as an important step in creating a new community. "Community always has elders..." he noted. "... shoulders on which we can stand. We didn't have that growing up." 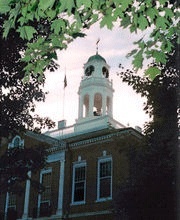 The following day, Emery was a special guest of the prestigious Phillips Exeter Academy in Exeter, New Hampshire - one of the nation's leading private schools for middle and high school age students. In addition to speaking to four classes over the next few days, Emery gave the Assembly address before the 1000+ student body on Friday, receiving a rare standing ovation from the students. "This is an amazing place to bring the film," he added. "The message of the power of true story seemed to resonate here among this very diverse and very talented student body. Believe me, the honor was all mine." Read an interview with Bishop Robinson about the film on Seacoast Online. the movie is great, a must see for anyone thinking of marriage. but to meet the director is a dream, those students are very lucky to have a faculty that brings them quality education and discussions like this.